In our article Common Pickleball Injuries and How to Avoid Them, we went to great lengths to emphasize the need for a good pair of dedicated pickleball shoes. One of the worst mistakes you can make when beginning pickleball, is stepping on the court wearing an ordinary set of gym shoes or running shoes. Using quality equipment is imperative to improving your game but it is equally as important to stay safe and avoid injuries. When it comes to avoiding debilitating setbacks, finding the best pickleball shoes can make all the difference. What is the best pair of pickleball shoes? Well, for men we recommend the latest version of the Adidas Barricade Boost for men - if you want all the bells and whistles and superior comfort. For women, we recommend the Gel Resolution 6 as it offers a great overall value for all the shoe tech packed into it! Update: I interviewed the owner of a big time paddle company and learned some facts about paddles I'd never heard of before! What I learned about sweet spots, and miss hits will shock you! As you'll see from our list, New Balance and Asics dominate the lineup. These two brands are by far the most popular when it comes to making quality tennis shoes that translate really well to pickleball. Please keep in mind, we have not played extensively in all the shoes listed below. 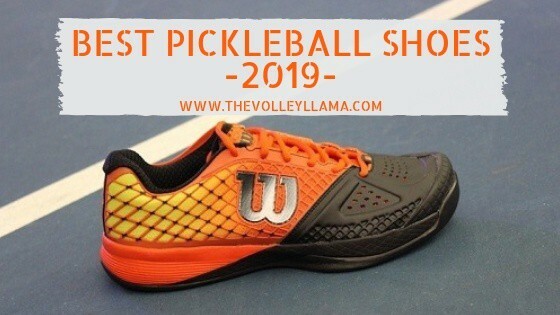 What we have done is compiled all the research available to create a list of the most highly rated, best selling, fan favorite pickleball shoes on the market. In short, if you’re in the market for a great pair of pickleball shoes, these are the ones to look at first. Before we get into our top picks, let's get into what makes a great pickleball shoe. The first requirement is that they must be court shoes. This automatically excludes running shoes or cross trainers. Those types of shoes are built for forward motion ONLY. This means that their rubber soles and the tread pattern on the outsole are not built for horizontal and lateral movement. This can lead to major knee, ankle and achilles injuries. Court shoes typically have rubber soles designed to withstand the wear and tear of moving forward, backward and side to side. Court shoes and more specifically, Tennis shoes have tread patterns built to not only withstand but improve the lateral cutting needed in sports like pickleball. It's important to look at the outsole of your court shoes to make sure they've got a lined pattern conducive for lateral durability. Good court shoes should have strong ankle support to keep players from ankle rolls. They also need a stiff toe box to allow for toe drag when volley play back and forth gets heated. They also need to be flexible at the toe joint where your foot is going to bend the shoe. Court shoes can be kind of stiff, so finding a pair with ample "bend" just in front of the laces is important. Finally, comfort is king. Your court shoe’s comfort comes directly from both the insole and midsole. The insole is going to support your arch from inside the shoe while the midsole provides the cushion for your ankle and knees. The more support you get from the midsole, the less wear and tear you'll feel on your joints. ​Court shoes are mostly used in sports like tennis, racquetball, squash and even volleyball, but as you'll see from our list of favorites below, those same shoes can also be effective for pickleball. Experts say you should replace your pickleball shoes every 60 hours. Depending on how much you play, that could mean rotating in a new pair every three to four months. Typically, the insole wears out first, which means comfort begins to be compromised. The rubber sole (or outsole) is designed to be durable and is meant to last longer. However, if the inner part where your foot rests is beginning to show age, it's probably time for a new pair. Pickleball pros also recommend separate pairs of pickleball shoes; one for use on indoor courts and one for outdoor courts. Experts﻿ say you should replace your pickleball shoes every 60 hours of play and recommend separate pairs for indoor and outdoor play. "If you primarily play on an indoor pickleball courts, you can select from the best line of court shoes or tennis shoes. If you play on outdoor pickleball courts most of the time, we recommend you select from a good pair of tennis shoes." 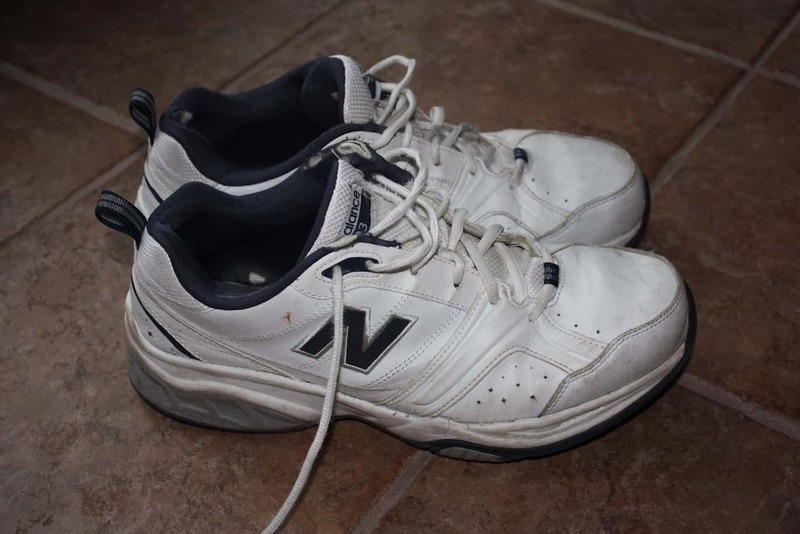 Known for their stability and durability, the New Balance 806s are tried and true classic tennis shoes that have been widely adopted by Pickleball players. The 806s are not flashy, but we can look past the boring, vanilla design because of just how long these puppies can last. Known for their support inside and stability outside, New Balance has incorporated their exclusive ROLLBAR technology into this shoe. This allows for superior motion control while cutting and keeps the rear of your foot/heel from sliding. These NB’s have stood the test of time for tennis lovers and are a must try for anyone getting into pickleball looking for maximum durability. Technically a volleyball shoe, the GEL-Rocket 7 makes our list because of its multifaceted design. The adaptable design makes it suitable for virtually any indoor court sport. Pickleball players with stability issues or plantar fasciitis will love the Rocket 7's rubber sole and will appreciate the Trussic system. Again, this system increases structural integrity and support while decreasing shoe weight...making the shoe solid yet light as a feather. It may not be as long lasting as other shoes on this list but it is a Top Pick on Amazon due to its affordable price tag, comfort level and stylish appeal. Another Asics makes our list in the Dedicate 4﻿﻿ Tennis Shoe. The D4 is known to be a “go to” court shoe for newcomers switching from running shoes or cross trainers. Players should immediately notice a difference in improved foot fatigue with this shoe when coming from other non-court shoe brands. This running shoe replacement is extremely popular on Amazon due to its entry level price point, lightweight breathable upper and lack of stiffness in the rubber sole and toe box. This eliminates painful break-in times considerably. The Adidas 2018 Barricade Boost men’s tennis shoe was just released and is already getting rave reviews. Based on the technology used, this is by far Adidas most impressive court shoe to date. The Barricade line of tennis shoes by Adidas has always been popular but the 2018 Boost model has taken the brand to new heights. Barricade models of the past have always used Adidas’s Adiprene and Barricade Chassis to improve the shoe's take off and stability. However, in 2018 Adidas went all-in with the Boost model and included Adiwear, Adituff, and Geofit tecnnology to the fold, making the Boost Adidas's most advanced court shoe to date. All this shoe tech comes at a price, but it is worth it if you’re looking for the best pair of shoes for pickleball. Fans of the other Barricade models will immediately notice the attention to detail here and love the heel support. It remains to be seen if there is enough Adituff to reduce toe drag scuffing but additional coverage on the front would ugly up an already very attractive shoe…so we’ll let it slide. Overall, we like the look and feel of this court shoe. It’s one piece design allows the top and bottoms of the shoes to fit snug as one piece. We also love the seamless mesh approach for breathability (sweaty feet is a problem for us) and added comfort. In fact, the one piece design and seamless stitching is what makes this the most comfortable Barricade yet, something previous iterations struggled with. In the end, this is one of the best court shoes from Adidas and works great for pickleball! The GEL Resolution 6 is one of the flagship tennis shoes from Asics in their line of footwear dedicated for stability and durability. Asics paid extra close attention to the toe guard and rubber sole, more specifically the outsole, to improve performance and toughness through technology they call PGaurd and AHAR. These are all fancy terms for a shoe that is designed to be tougher than your traditional mesh based court shoe. To be fair and balanced, players with the need for extra support in the arch may want to choose another option. The GEL Rocket 7 is technically a volleyball shoe but is used by many pickleball players due to its versatility. It has a rubber sole capable of being played on outdoor pickleball courts as well as indoor courts. Asics is known for its outsole Trussic system which enhances structural strength and durability without sacrificing weight and comfort. Players love this shoe’s combination of comfort and grip and rave about how well they feel right out of the box. Also, Amazon tends to have more color options for this shoe versus your local retail store and usually has better prices! A minor drawback is the cosmetic design. Despite more feminine color options in the women’s version, the shoe still has a masculine look and feel. These are not exactly “super cute” pickleball shoes. However, we can look past the cosmetic drawbacks due to it's versatility -this is a great multifaceted court shoe capable of being used across multiple court sports. The Dedicate 4 is a great entry level court shoe at an entry level price. This shoe is a fan favorite because of it’s minimal break-in period and comfort level from day one thanks in large part to the Asics Forefoot Cushioning System. This cushioning system, along with their Trussic system allow for superior structure and support. This is a great tennis shoe that combines ample comfort with enough backbone of support for those with knee issues or even shin splints. It comes in three colors, Indigo Blue, Black with Gecko Green, and the more popular Cotton Candy Pink. If the GEL Dedicate 4 mentioned above is an entry level court shoe, than the GEL Game 5 is a step up to the next level. Slightly more expensive than the Dedicate 4, players should expect the same level of support and cushion but superior durability provided by Asics PGaurd technology. PGuard protects the toe box giving the shoe durability to withstand toe drag that is common on outdoor pickleball courts. Finally, for the ladies looking for a pair of pickleball shoes with “super cute court appeal” - this is it! From it's colorful rubber sole to it's eye catching heel counter, this is arguably the best looking women's tennis shoe with the best color options. The Asics Resolution line is the flagship line of court shoes for the serious pickleball player. The Dedicate 4 and the Game 5 represent the lower and middle tier court shoe while the Resolution 6 is a high end shoe showcasing Asics Shoe Technology: PGuard, GEL Cushioning, Trussic and lightweight Midsole material called Solyte. All you need to know is that this tennis shoe has everything Asics offers from it's rubber sole to it's upper - perfect for elite stability, control and comfort. It’s easy on the eyes too with a total of eight eye catching color schemes. Of all the women’s court shoes listed, this is the one used the most by Amazon shoppers for pickleball. They are specifically raved about for how well they perform on outdoor pickleball courts! With all that form fitting technology incorporated, the GEL Resolution 6 does come at a heavier price tag. As expected, it’s the most expensive of the Asics line of court shoes. But, they’re well worth it! Once players get a taste for the Resolution line of court shoes, they tend to stay with them and never go back! The T22 line of tennis shoes from Prince is widely known as the most popular tennis shoe amongst tennis enthusiasts, so it should come to no surprise that it also made our list for pickleball shoes. The T22 is a great tennis shoe in the breathability department because of it’s synthetic mesh upper and mesh tongue. This shoe comes with a clever sock liner that is removable so you can add or remove cushioning based on your individual needs. Prince has even included multiple lacing options to add to it’s customizable look and feel. This is an extremely well designed shoe at a mid-tier price point that has the look and comfort of a much more expensive court shoe. It should be noted that their is a T22 “Lite” version, that runs a little on the narrow side and is not as widely used. For an in-depth look on what makes the Prince T22 such a great court shoe, check out the full length review from our friends at Soleofathletes.com. The proper attire can improve your game but don't forget to check out our strategy articles. As we said before Asics and New Balance dominate our list because of the quality of shoe they produce. Asics even makes high quality running and walking shoes. We can help you improve your Serve, Return of Serve and show you how to maintain consistency during the crucial Third Shot. Was this article helpful? Are you a big fan of a tennis shoe that did not make our list? Scroll down to the comments section and tell us which one and why we should include it on the list.